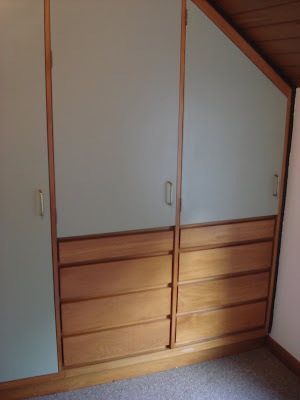 Finally, I've finished the spare room cupboards. We're happy with the colour, if anything it's a bit boring, but it's a huge improvement on the buttercup yellow that was there previously. The photos make it look more washed-out than it is - it's much more of a rish sage green. I've done the other spare room in the same colour, and polished the handles. We are missing a handle, so I have spent a few days calling round trying to find a replacement - turns out they don't make any handles in that length anymore (quelle surprise! ), but some guy in Wellington had a box of them 'out the back' so I have ordered a couple of them. I won't know for sure if they're okay until we get them, but I'm optimistic. We still haven't decided on what colour to paint the main bedroom cupboards - Matt is keen on the original bright orange, but I'm not so sure.